Cracks and holes in plastic vehicle parts almost always cause considerable aggravation. Because especially with older vehicles, replacing with a new part is usually not economical. But it‘s also possible to make durable and invisible repairs on, for example, bumpers. Tool specialist KS Tools have the right tool for this in their product range. With the plastic welding equipment, repair shop professionals can simply melt a stainless steel patch into the cracked area to produce a long-lasting joint. Holes can be filled with matching plastic using this equipment then later painted. That saves money and spares the environment. The KS Tools part number is 960.1120. „Damage, especially on bumpers, are the order of the day“, explains the KS Tools project management. „These expensive parts are often replaced, even though it would be possible to repair them. Many mechanics don‘t even know there is a cost-effective and really sustainable repair option.“ With the plastic welding equipment from KS Tools, repairing plastic parts is quite simple. With cracks, the workshop professional simply lays a small piece of stainless steel mesh over the repair site. This is then welded into the plastic using the welding equipment in a similar way to ironing and produces a durable joint. 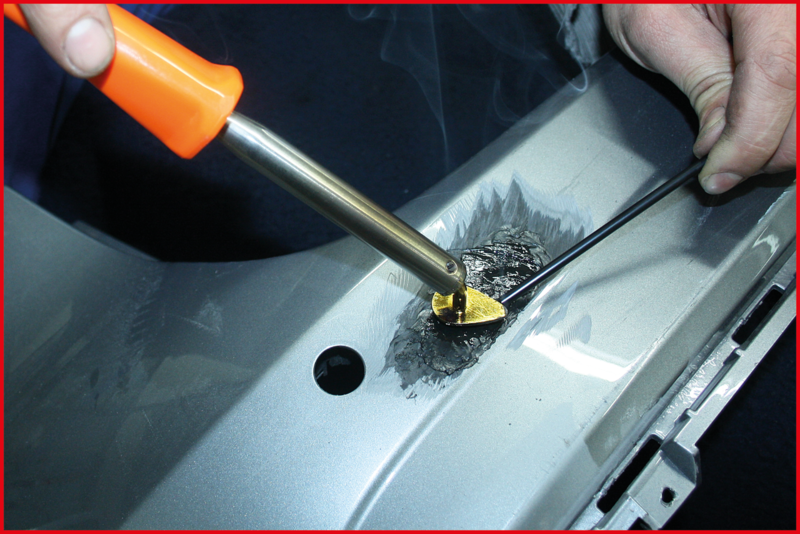 Chipped or missing material caused through an accident, small holes or too little material thickness can simply be filled out using the optionally available repair sticks. The visible side of the repair site can subsequently be filled with special plastic stopper, sanded off and painted over. Because the point of the tool is actually shaped like a mini-iron, even difficult to access places can be worked on. For the point can get to almost any corner. Headlight brackets, for instance, can also be repaired soundly using the welding equipment so here, too, one can dispense with a frequently expensive spare part. Further areas of application for the easy to handle welding equipment are wings, interior trim, engine covers or motorcycle parts. That‘s because the rust-free reinforcing mesh imparts particularly good stability to the repaired component. This becomes apparent above all with parts which are subject to high levels of vibration. They hold as securely after the repair as before. Repairs are best carried out on the reverse side of the component. That has the advantage that the front side need then only be worked on minimally. This simplifies the repair and improves the result. Suitable adhesive material is available for the plastic welding equipment as an accessory. These adhesive sticks cover the most commonly occurring plastics in automobile engineering. Thermoplastics and thermosetting plastics can easily be touched up using these. If it‘s not known which plastic the damaged component has been produced from, look out for an impression which is applied to every plastic part. If it isn‘t obvious what the material is, there is still the option of removing a piece of plastic from a hidden spot and then using this as adhesive or filler material. That makes certain in any case that the right material is being used. Together with the additionally available adhesive sticks the plastic welding equipment is suitable for the following materials. Thermoplastics: PP /EPDM, PP, TPO, TPE, TPU, TPUR, PE. Thermosetting plastics: PUR, RIM, RRIM, EEBC, EMA. the new motor vehicle catalogue K15 from KS Tools.